Inspired by a moccasin silhouette we refined the shape with feminine contours adding logo-print canvas and an oversized charm for signature appeal. Sleek enough to fit into your tote this pair is ideal for crosstown errands and city commutes. Michael Kors tan ballet flats with gold studs in women's size 7 1/2. These shoes are pre-owned and in excellent condition. There are no stains, rips or tears. MICHAEL Michael Kors Sutton Mov Suede Bow Moccasins Oxblood, Size 7.5 $99. Shipped with USPS Priority Mail. I Will Try My Very Best To Make You Happy. photos Are Of The Actual Item; What You See Is What You Get. This Is In New Never Used Condition. Michael Kors Lillie Moc Bright White w/ Silver Hardware Women's sizes 5-11/NEW!! Soft suede moccasins with bow and logo embossed aglet detail at toe. Suede upper,easy slip-on silhouette. Square closed-toe flats with rubber grip on the sole. Leather upper. Quilted leather upper. Color- Dusty Rose Pink. Leather lining. Lightly padded leather footbed. Signature logo and bow detail. Michael Kors Lillie Moc Acorn Leather w/ Gold Hardware Women's sizes 5-12/NEW!! 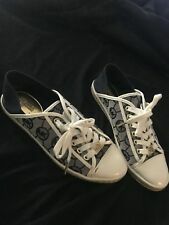 COACH Kristy Slide Monogram Sneaker 7.5. Monogram jaquard fabric/canvas fabric suprema nappa sport leather upper; manmade sole. Reinvent your style for LESS! We are passionate about and committed to helping you create your best personal style at prices you can afford. KEATON Slip On Sneakers. LASERED SUEDE. Material: Suede Upper. Padded insole, rounded toe, slip on. 100% AUTHENTIC. Michael Kors Fulton Moc Luggage Women's sizes 5-11/NEW!!! Part No - MG18J. Guilian Moccasin Flat Logo. Color - Brown / Logo. I do not provide Doctorate less value for International Sale, DO NOT EVEN ASK THIS. Rubber outsole. Leather upper features leopard print detail. Padded tongue and collar.